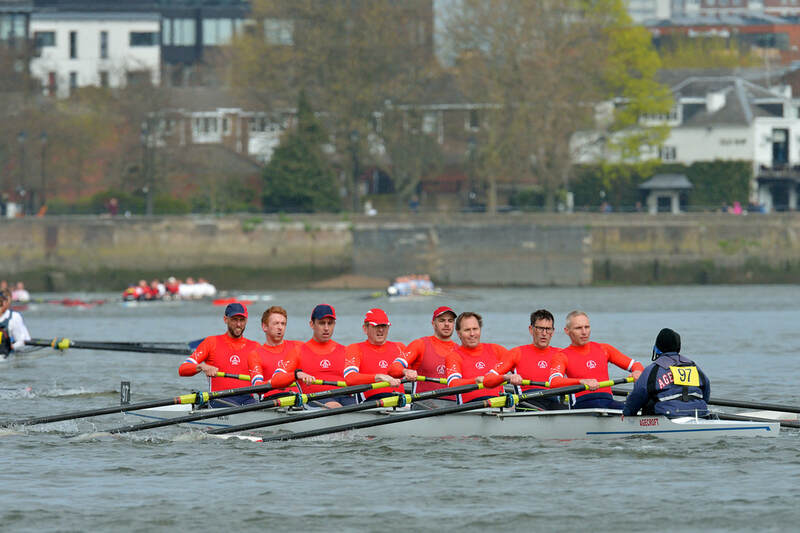 In a stark contrast to the Eights Head on Saturday, which was a glorious day, three Agecroft eights had to contend with an overcast and rather blustery conditions at this year’s Vesta Vets Head on the Tideway Championship course. Racing with the stream but against the wind made for ‘challenging’ conditions in places and the headwind was particularly unwelcome in the final few minutes of the race. Agecroft Masters A women led the race starting number 1, with over 260 crews chasing them down the river. The ladies led the event this year to mark Mother’s Day, and our ladies retained the Masters A pennant for an impressive 3rd consecutive year. Next up were the Masters A men, all of whom had raced the day before. The addition of this crew made our entry the largest in the clubs recent history. Finally the Masters C men, competing on the Tideway for the 7th time in this event. Sandwiched between very strong crews from London and Upper Thames, they knew it was going to be a tough race, particularly with a last minute crew change. Claire Sherwin excelled in the coxes seat as she weaved passed 6 crews in hot pursuit of London RC, with the crew finishing 4th in Masters C, a very credible 16th overall and less than a minute behind the youngsters.